Have you ever had a day filled with more questions than answers? Some days are like that. Believing that you have all the answers is comforting, absolute, and gives you the ability to function on autopilot, not complicating your days with messy ambiguities. But if you’re a person who enjoys asking “why” and “why not” and “what if,” then you are open to all kinds of possibilities. I believe artists mostly fit into the second category of people, the ones who nurture a love of curiosity. Without the ability to question, experiment, and test theories, we are just technicians. We go through the necessary steps to become proficient at a craft, sometimes to a dazzling level. Then when we become experts at that one thing, the rest is just rote and becomes stale. For me, it’s the thrill of the chase. Always questioning, testing, asking why. I believe it’s that quality that keeps us learning, growing, playing. 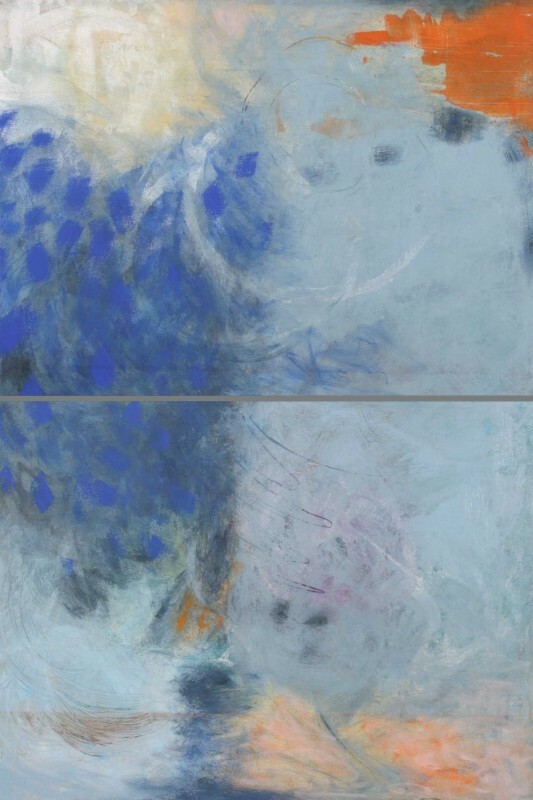 Flutter - Diptych, Acrylic on Canvas 60x40"
Wonderful words for artists especially, but for everyone else as well. Love these, the colours, the movement, the ethereal quality, just so cheerful and happy. We’re now starting on a major project at our art class, have to do the planning for it before next lesson. Have booked in for a further course when this one finishes. Don’t have a camera so can’t show anyone though! Thank you Sandra! Your project sounds intriguing. I’m hoping you’ll put up a link to some pictures soon.